Hey Key Clubbers! My name is Yohana Rodriguez and I am your club president for the 2015-2016 school year. I am so excited to be able to spend this term with you guys. I've been in keyclub since my freshmen year and it has honestly become part of who I am. I love helping others, meeting new people, & most importantly VOLUNTEERING! I hope to use all the knowledge I've gained about this club over the past 3 years and improve our club to its full potential. Lets make great memories together as we take on another year of service! 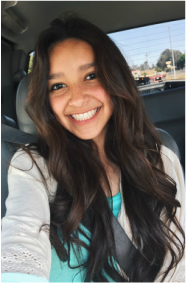 Besides Key Club I am also the Senior Class President of the c/o 2016, I am a varsity cheerleader, I volunteer at the local Fresno Chaffee Zoo every summer, I am enrolled in the leadership class at Edison, and I have a job as a peer mentor at Gaston Middle School. "Fall Rally North was my Key Club moment! :')"
Hey guys! My name is Isabel Hernandez, but my nickname is Izzy. I am so proud to say that I will be serving the term 2015-2016 as one of Key Club's valued Vice Presidents! I have been in Key since freshman year, but it wasn't until the end of freshman year that I really saw how much Key Club mattered to me and I am so gratetful to be apart of something so big! It is my personal goal to see Key Club's stamp put on Fresno and by that I want to make changes in our community to make it better. I am very passionate about this club and I will make it my duty to help out in anyway I can. I also know of a lot of volunteering opportunities that I personally sought out earlier in the year so I will have a lot of new opportunities as a club as well! Aside from Key Club I most enjoy running, writing, and volunteering but I also am a learner. I love to learn new things! If you have any concerns or questions or even ideas please feel free to text me or email me. Thank you Edison Key Club! ATTENTION KEY CLUBBERS!!! Whether you are a brand new member or a returning one you have made a fantastic decision to join our club. This year is going to be amazing for both you and the people you help so I hope you have as great of an experience as me and my fellow officers have. My name is Whitney Markwardt and I have been in key club since my freshman year and have loved every minute of it. I am the new editor for this school year and I can't wait to get started! Writing and photography are some of my greatest passions in life and I'm so excited to have the opportunity to use them in Key Club while benefiting our community in Fresno and even around the world. I'm looking forward to getting to know all of you members and I'm so excited that you've chosen to get on board! Feel free to contact my anytime if you have any questions or concerns. GO TROJANS!!! !